The then seventeen-year-old artist Rembrandt Peale painted George Washington (1732-1799) from life for three days in 1795. 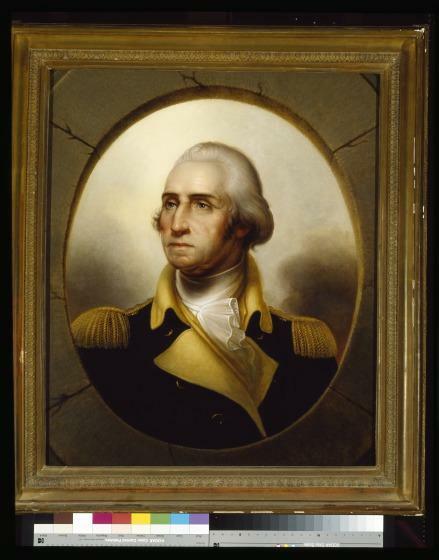 The opportunity came thanks to his father, artist Charles Willson Peale, who had befriended the president and completed several acclaimed portraits of Washington as a general. As Rembrandt Peale remembered later about the seven a.m. appointment with the president, "I was up before daylight and putting everything in the best condition for the sitting with which I was to be honored, but before the hour arrived became so agitated that I could scarcely mix my colors." 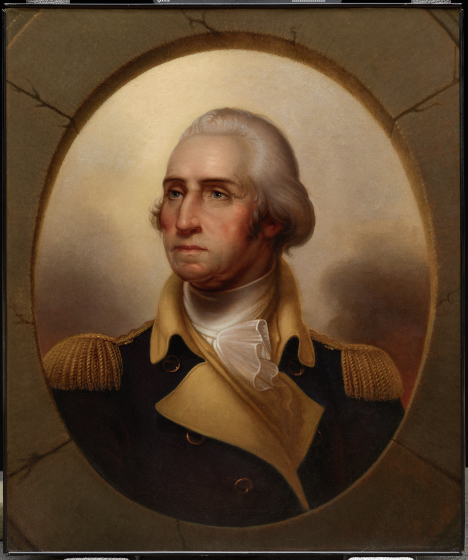 Although Washington's popularity waned at the end of his life, the country's return to war with Great Britain in 1812 and Mexico in 1846 brought new cultural significance to the nation's founding. In 1823, long after Washington's death and in response to the enduring popularity of Gilbert Stuart's portrait of the president, Peale revised his original studies into Patriae Pater (1824), a work he intended to be the "standard likeness" for future generations. The neoclassical portrait, which associated President Washington with Solon, the Lawgiver of Athens, epitomized the young nation's desire to emulate the civic virtues of the first republic. Peale was keenly aware of the symbolic, and he hoped financial, benefits of establishing himself as the premiere painter of the first president. The work shown here is one of the estimated seventy-nine replicas of Patriae Pater's primary motif produced by Peale between 1824 and 1860. Peale widely advertised these works through pamphlets that included confirmations of the president's appearance and personal recollections by Washington's friends and acquaintances. 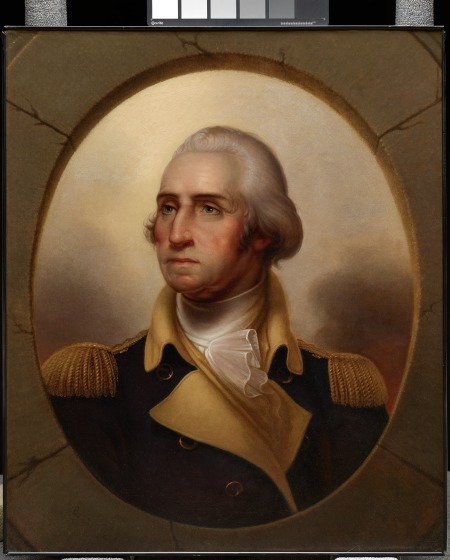 He also delivered lectures on the portraits, believing that, in addition to edifying the public, such a personal association with Washington dignified his own career as a portraitist. In this painting, Peale idealized Washington's features according to fashionable theories of physiognomy, in which facial proportions acted as signs of character or moral standing. 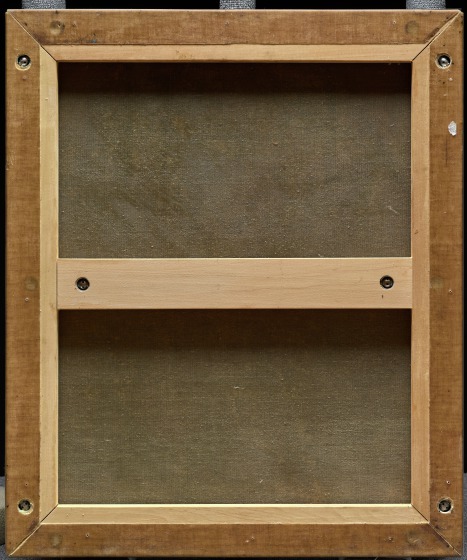 The very soft modelling in this example is characteristic of the later copies that Peale produced for admiring patrons. He also set the three-quarter length bust into a fictive oval opening recalling both antique sculpture and Renaissance and Baroque state portraiture, perhaps angling for display in the neoclassical interiors of the nation's new Capitol Building. The architectural oval, called a porthole, was often used in paintings and prints to signify the honorable status of the sitter. The clouds filling the background of the oval indicate the heavens and suggest the first president's enlightened mind and ennobled stature. William Keyse Rudolph, DMA Label copy (1987.41), May 2006. Gail Davitt, DMA Exhibition Label copy (1987.41) for "Faces of a New Nation: Colonial American Portraits" (October 19, 1997 - January 10, 1998), September 1997. DMA Label copy (1987.41), TMS curatorial remarks, 1987. When Rembrandt Peale had to leave his position as the director of the Baltimore Museum in 1822 because of personal debts, his younger brother Rubens Peale took his place. 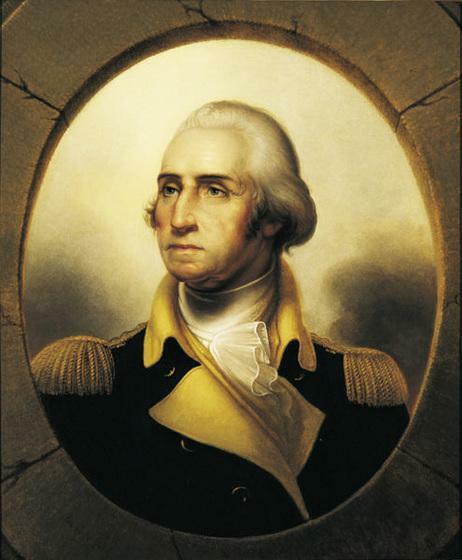 In the numerous copies of this portrait, Rembrandt Peale occasionally made small changes—George Washington sometimes is shown looking to his left, or he wears civilian rather than military attire. When he first went to study under Benjamin West in London, Rembrandt Peale and his brother, Rubens, were transporting one of their father's prized mastodon skeletons. In 1816, Rembrandt Peale was one of the founders of Gas Light Company of Baltimore (now Baltimore Gas & Electric Co.), the country's first commercial gas company. According to a letter from Rembrandt Peale to journalist Charles Henry Hart (September 24, 1860), in addition to making at least seventy-nine copies of the porthole portrait, Peale also made at least thirty-nine copies of his father's portrait of the first president. 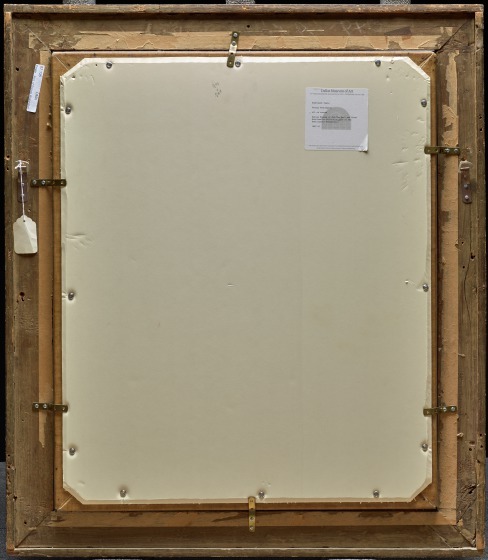 The DMA owns two reproductions based on Charles Willson Peale's portraits of Washington (1941.20) and (1992.B.56). Among his many talents, Rembrandt Peale was an author. He published an account of his voyage to Italy in 1831, a manual for artists in 1835, an autobiography in 1838, and a series titled "Reminiscences" for the journal Crayon from 1855 to 1858. Look at the painting that Rembrandt Peale considered the "standard likeness" of Washington and served as the basis for the copies he produced for the remainder of his life. Compare Rembrandt Peale's portrait of the first president with Peale's portrait of the first, first lady (available through Wikimedia). Read more about this artist in Carol Eaton Soltis's biography of Rembrandt Peale. Look through the digitized papers of Rembrandt and Harriet Peale, including an essay about the importance of presidential portraiture, through the Archives of American Art, Smithsonian Institution. 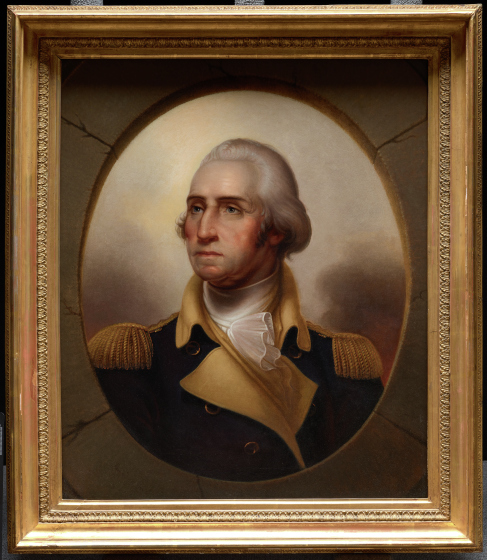 Read a full analysis of Gilbert Stuart's influential portrait of the president through this special feature on the Smithsonian National Portrait Gallery's website.